Legends to celebrate the United States Armed Forces July 8! Military Appreciation Night will be highlighted with historic ceremonial first pitches and recognitions! WHITAKER BANK BALLPARK (Lexington, KY) - Honoring the United States Armed Forces is something that the Lexington Legends do every home game in a variety of ways, but there is always one game dedicated to specifically saying "Thank You" to those who have served our country. 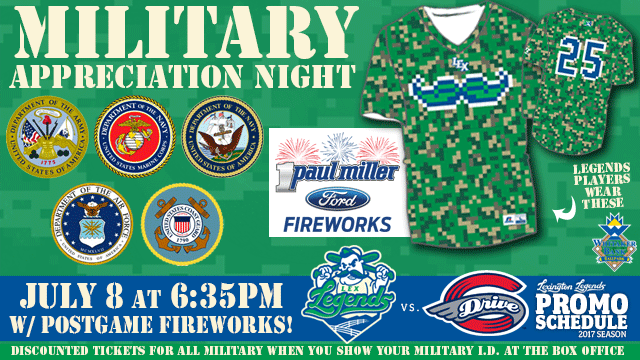 July 8th is the night the Lexington Legends have reserved as their Military Appreciation Night, which has been celebrated by the organization since their inception in 2001. Military Appreciation Night is presented by LFUCG Department of Environmental Quality. The night features special ticket offers and discounts for Active Duty and Retired Military as well as Veterans, Armed Forces branch music and recognitions throughout the game, a 20 foot by 30 foot American Flag in the outfield for the National Anthem, Mine-craft inspired digital camo jerseys worn on-field by the Legends players, with those jerseys in a silent auction taking place throughout the game; giving fans the opportunity to take home the special jerseys, the Joe Everson original painting of Iwo Jima (from the July 4th National Anthem) will also be included in the silent auction, and much more. The most highlighted features of the evening are the honorary ceremonial first pitchers and four of the thirty people who will be unveiling the 20 foot by 30 foot American Flag for the National Anthem. There will be five ceremonial first pitches tossed out by five unique individuals who have bravely served our country in one way or another. First, Colonel Pete Evans, U.S. Army (RET) who has served in Afghanistan, Korea and to the Pentagon. Second pitch will be Mike Niklarz, who is the Director of Kentucky's National Cemetery Complex, which consists of 9 locations and includes historic Camp Nelson National Cemetery. The Legends third ceremonial first pitch is a 30 year U.S. Air Force veteran and Master Navigator Colonel Mark Roland. Colonel Roland and his wife Barbara are also Gold Star parents-their son, Air Force Captain Matthew Roland paid the ultimate sacrifice August 26, 2015 and was posthumously awarded the Silver Star for gallantry. Gunnery Sergeant James R. Barnett is the fourth ceremonial first pitch, as he has been named "Non-Commissioned Officer of the Year" for the 623rd Field Artillery Battalion, the 38th Field Artillery Brigade, and the Kentucky National Guard for 2017. The fifth and final ceremonial first pitch is 97 year old Captain Helen Horlacher Evans, from Lexington, Kentucky. Captain Helen Horlacher Evans is one of the few remaining female World War II veterans still alive today. The National Anthem for the July 8 game will feature a 20 foot by 30 foot American flag, unveiled by the assistance of thirty retired military, veterans, military family members, and four Tuskegee Airmen; the first African American Fighter and Bomber Pilots in the United States Armed Forces. The Legends welcome media for photographs and interviews to help honor and support those who will be recognized at the 2017 Military Appreciation Night game, July 8 with gates opening at 5:30pm and first pitch 6:35pm. 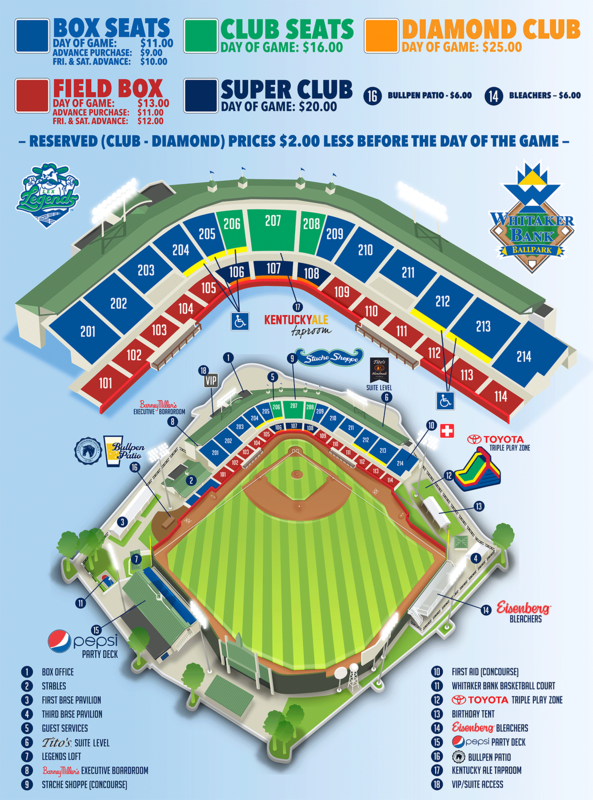 For more information, contact Sarah Bosso at sbosso@lexingtonlegends.com or 859-422-7855. The Legends, a Single-A affiliate of the Kansas City Royals and a member of the South Atlantic League, continue the homestand July 8-10 at Whitaker Bank Ballpark against the Greenville Drive, an affiliate of the Boston Red Sox. For ticket information, call 859-422-7867 or visit lexingtonlegends.com.